Bài báo trình bày kết quả nghiên cứu ảnh hưởng của các yếu tố công nghệ như nhiệt độ và thời gian nấu luyện tới thành phần của hợp kim kẽm nhôm (Zn15Al0.5Mg). Kết quả nghiên cứu cho thấy nhiệt độ nấu luyện càng cao thì các kim loại càng bị cháy hao càng lớn, đặc biệt là Mg.
Bài báo trình bày kết quả nghiên cứu ảnh hưởng của các yếu tố công nghệ như nhiệt độ và thời gian nấu luyện tới thành phần của hợp kim kẽm nhôm (Zn15Al0.5Mg). Kết quả nghiên cứu cho thấy nhiệt độ nấu luyện càng cao thì các kim loại càng bị cháy hao càng lớn, đặc biệt là Mg. Kéo dài thời gian nấu luyện cũng làm tăng cháy hao kim loại. Nhiệt độ phù hợp cho nấu luyện là 520oC và thời gian nấu 15 phút. Hợp kim đạt được có tổ chức, độ bền và độ cứng đạt yêu cầu đối với vật liệu dùng để chế tạo bạc lót. Zinc-aluminum alloy (Zn15Al0.5Mg – SAM15) was prepared via melting. Effects of factors such as alloying tem- perature and time on the melting and alloying process are investigated. The results show that during alloying, high- er temperature will promote metal oxidation resulted in the excess loss of metals, especially Mg and thus changed the alloy compositions. Longer alloying time also caused excess loss of Mg. The suitable temperature and time for alloying were found to be 520oC and 15 minutes, respectively. The SAM15 alloy obtained has the microstructure, tensile strength and hardness suitable for bearing application. Keywords: zinc alloy bearing, SAM15, zinc-aluminum alloy. Zinc-aluminium alloys have been found to be a potential candidate material which could replace bronzes economically and more efficiently in appli- cation such as sliding bearing materials [1, 2]. In (plain) bearing applications, the zinc-based alloys possess several advantages such as low cost, high resistance to wear and abrasion and have the ability to withstand high loads and good emer- gency or dry running characteristics. The alloys also have lower density compared to that of tradi- tional bronze alloys, better castability, lower ener- gy requirement for shaping, better strength and higher hardness [3-9]. The limitation that the zinc-based alloys can only be used effectively under slow to medium speed conditions is because a drastic deteriora- tion in their properties occurs above an operating temperature limit of (100-120) oC [5, 10, 11]. Almost all zinc-aluminum alloys for bearing application are produces by casting. During the alloying process, other alloying elements such as copper, silicon or magnesium can be added into the alloy. The addition of Mg into the alloy limits other impurities influence, particularly Pb and Sn. It also reduces inter-crystalline corrosion . However, addition above 0.1% Mg deteriorates castability, increases high temperature brittleness and leads to casting cracks. In this work, effects of several factors on the composition of zinc-aluminum-magnesium alloy have been investigated. The factors are alloying temperature, alloying time and also the amount of degasing agent used. The final alloy obtained with the best composition was cast and machined to prefixed bearing shape and properties of the alloy such as tensile strength, hardness are measured. The Zn15Al0.5Mg alloy was prepared via cast- ing process, the initial materials were aluminum, zinc and magnesium metals. The compositions of aluminum and zinc metals are shown in table 2.1 and 2.2, respectively. Magnesium used has the purity of 99 % or higher. Table 2.1. Aluminum composition Aluminum metal was first melted at (700-750) oC, Mg then added into the molten alu- minum to produces Al-Mg alloy. The alloy was then cast as an intermediate alloy for next steps. Zinc metal was melted at (460-480) oC, the intermediate alloy Al-Mg was added into the molten zinc. 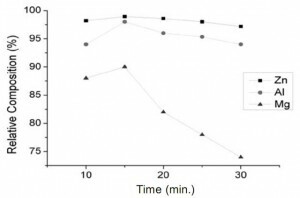 The melt temperature (480-640oC), alloying time (10-30)min and the amount of degasing agent added into the melt were varied according to experiments. 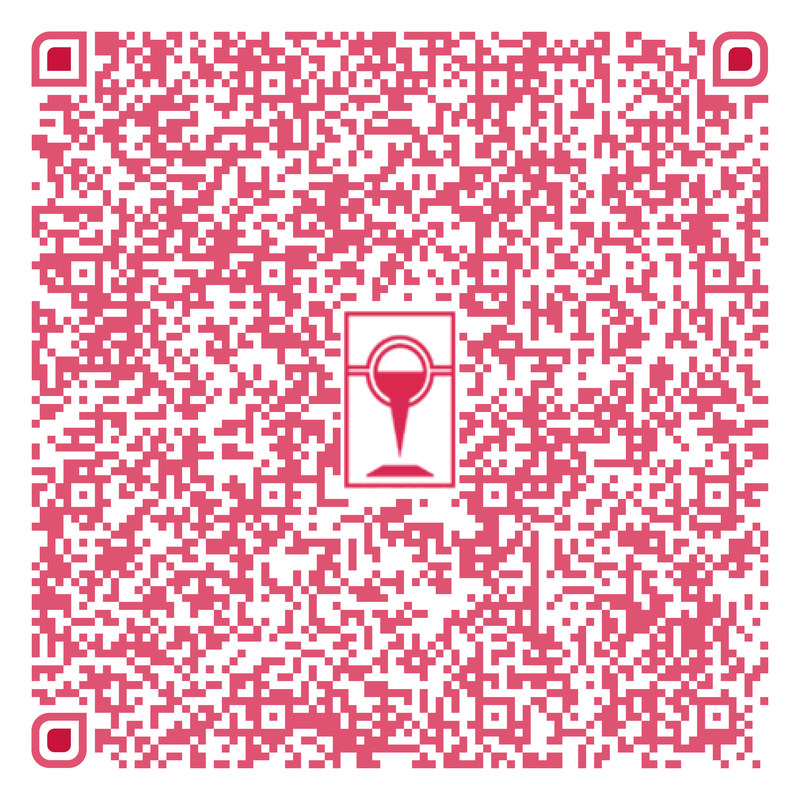 Chemical compositions of the alloys obtained were analyzed using chemical analysis. The alloy was cast into specimens. Mechanical properties such as tensile strength and hardness were mea- sured and microstructure of the alloy was observed by SEM. Theoretically, the SAM15 alloy is based on zinc; the alloying elements are 15% aluminum and 0.05% magnesium. The relative compositions of the cast alloy are calculated based on this theoretical composition. To study effect of alloying temperature on rela- tive composition of the alloy, the alloying time was pre-fixed at 15 minutes, alloying temperature were varied from 480oC to 640oC and the results are shown in figure 3.1. The results show that after alloying at 520oC, relative composition of the alloy obtained is close to the theoretical composition. Relative composi- tion showed a slight increase at first in all cases but then a rapid reduce when temperature increases. Alloying temperature is one of the factors sig- nificantly affecting the alloy composition, especial- ly for alloy containing relatively active metals such as the SAM15. High alloying temperature might give better distribution of alloying element but also increases loss of metals thought oxidation. 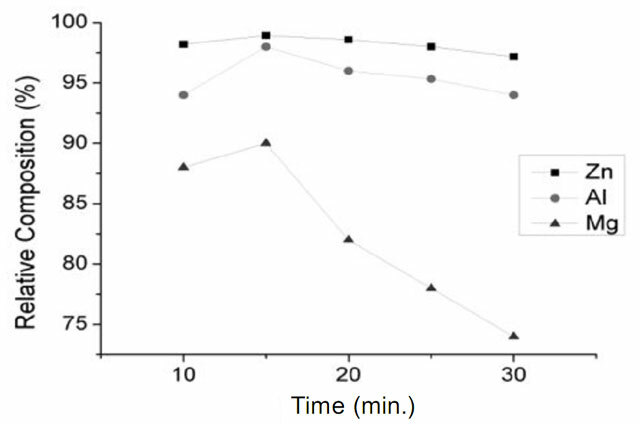 The loss due to oxidation is very important especially when alloy contains magnesium, as depicted in fig 3.1, the loss of magnesium increases rapidly with temperature. When alloyed at 640oC, the obtained alloy contained only 0.039 % Mg, or the Mg rela- tive composition is only 78 %. Low alloying temperature, however, might restrict the distribution of alloying elements; it might also cause the loss of metals due to crucible stickiness. As can be seen in fig 3.1, the alloy com- position obtained at 480oC has a major difference with the required one. Alloying temperature also is considered (to be) important because it decides the pouring temper- ature, thus influences the casting process. A suit- able alloying temperature should be low to restrict metal oxidation, but be high enough to meet the requirement for pouring temperature. From the results, it can be concluded that after 15 minutes of alloying, 520oC is the most effec- tive alloying temperature to fabricate SAM15 alloy, considering relative composition of the fab- ricated alloy. 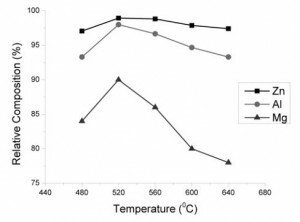 To study effect of alloying time on relative com- position of the alloy, the alloying temperature was fixed at 520oC, alloying time were varied from 10 minutes to haft an hour and the results are shown in figure 3.2. As showed in fig 3.2, when changing the alloy- ing time, relative composition of Zn and Al have slightly change but Mg content has largely reduces. After 30 minutes, the relative composition of Mg is only 74 %, or the amount of Mg remains in alloy was only 0.037 %. The time in which molten alloy is kept at a cer- tain temperature for alloying is also an important issue. The alloying elements take some time to be dissolved and distributed in the alloy, but longer time may cause excess oxidation of the elements. It can also be concluded that 15 minutes is the most effective alloying time, the alloy obtained has the best relative composition compared to the the- oretical one. 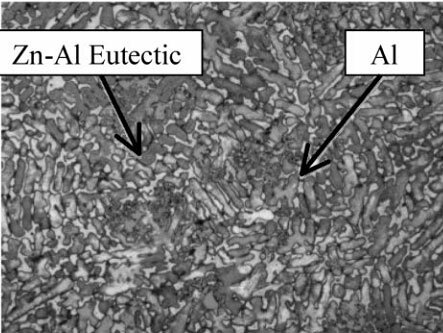 Microstructures of SAM15 alloy are shown in fig 3.3. The alloy consists of two main phases: hard zinc-aluminum eutectic phase (dark regions) and softer aluminum phase (bright region). 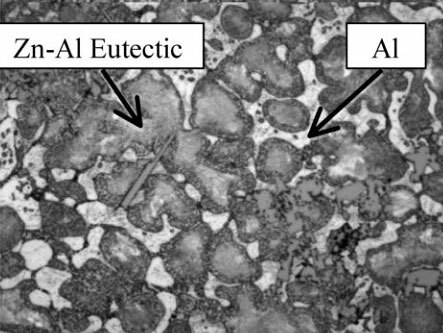 The alloy microstructure explains its wear resis- tance property as the hard eutectic will be the wear-resistant phase, meanwhile the softer alu- minum wear-out creates channels to allow lubri- cant to flow on the bearing surface. The fine distri- bution of the hard eutectic phase resulted in high tensile strength and hardness of the alloy. Tensile strength and hardness of the SAM15 sample were 115 HB and 400 MPa, respectively. The results show that during alloying, higher temperature will promote metal oxidation resulted in the excess loss of metals, especially magne- sium and thus changed the alloy compositions. Longer alloying time also caused excess loss of magnesium. The suitable temperature and time for alloying were found to be 520oC and 15 minutes, respectively. The SAM15 alloy obtained has the microstruc- ture, tensile strength and hardness suitable for bearing application.